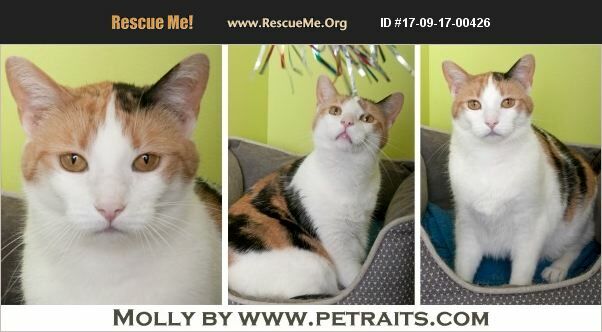 Molly is a stunning, sweet and playful, amber-eyed, three-year-old, 12-pound, female calico cat looking for a loving guardian. Molly has gorgeous Calico markings and is loving and gentle with people. She is a little shy in a shelter setting and would be happy in a home as the only cat or with one or two other gentle-natured felines to share her space and life with. She is healthy, spayed, up-to-date on vaccines, micro-chipped and virus-tested. She has all her claws, but she's not at all aggressive. In fact, they thought she was de-clawed at the shelter because she was so gentle. To meet and possibly adopt Molly, please fill in the online adoption application at http://www.famousfidorescue.com/CatAdoptionForm.html and follow up by contacting Gloria at fido@famousfidorescue.com or 773-907-0305. Molly is at the Famous Fido Rescue, 3124 W. Irving Park Road at Troy Street in Chicago, Illinois 60618. Please call or e-mail for an appointment to meet her and all the other wonderful cats and dogs. Her adoption fee of $125 benefits the rescued pets of Famous Fido's.